The future of the Cotonou Agreement and of the African, Caribbean and Pacific Group (ACP) will command a great deal of attention over coming years. Cotonou runs out in 2020, and it may or may not survive. If it does not, the ACPAfrica, Caribbean and Pacific is likely to fall with it. This is a topic I have written and spoken on many times over the years, most recently in 2011, as a contribution to a debate hosted by ECDPM in Maastricht. I was keen to catch up with the current debate, which is why I was glad to be asked to speak at an ECDPM forum in Brussels on whether the ACP-EU framework is fit for purpose. In preparing for the event, I discovered that there is already a good deal of work on the future of Cotonou, by the ACPAfrica, Caribbean and Pacific itself, by the EUEuropean Union Commission, and by some Member States. Of particular interest are: the report of the ACPAfrica, Caribbean and Pacific Ambassadorial Working Group (December 2014); the work of ACP Eminent Persons Group, led by Chief Obasanjo (forthcoming); a review commissioned by the Government of Sweden from Ambassador Anders Oljelund; the review by the Dutch Advisory Council on International Affairs (March 2015) and the Government’s response; and of course ECDPM’s own work on the subject, including a political economy analysis of Cotonou. The Commission published a consultative Green Paper on 6 October. It will then prepare working papers and a Communication by mid-2016. The European Parliament is planning an own-initiative report. Better global governance is the stand-out challenge of present and future time. Better diplomacy is the need of the hour, and diplomats are the new Masters of the Universe. Clubs still matter in diplomacy. Clubs are proliferating, but to rather little effect: global clubs are not, taken as a whole, in good shape. Clubs should be judged by whether they are (a) relevant, (b) effective, and (c) efficient - and this provides both a template for analysis and a route to reform. The first axiom is that better global governance is the stand-out challenge of present and future time. This is not because nation states, regions and cities do not face challenges, but rather because global spillovers and cross-border issues require new levels of ambition and delivery in terms of collective action. There is nothing new about this thought. Inger Kaul published her first book on global public goods in 1999. Since then, however, we have had food, fuel and financial crises, global health epidemics, accelerating climate change, and conflicts which require coordinated action across many different geographies. At the same time, development agencies have recognised that they need to rebalance their portfolios, maintaining a commitment to poverty reduction in the poorest countries, but also giving more emphasis to global issues and to policy coherence. The UK Parliament’s Select Committee on International Development made this point in its recent report on the Future of UK Development Cooperation. It is also a key theme of ODI’s work on Future Development Agencies. The second axiom is that if better global governance is to be delivered, then better diplomacy is the need of the hour, and diplomats are the new Masters of the Universe. Again, I do not want to oversimplify. The axiom does not suggest that diplomats can deliver consensus when interests diverge to an impossible degree. However, it does suggest that nimble diplomacy can help in brokering global deals – and that development agencies need diplomatic skills at least as much as they need project management or sectoral expertise. I wrote about the changing competences required in development agencies in 2005 in a piece entitled ‘Spyglass, Spigot, Spoon or Spanner’. In subsequent years, we have seen growing numbers of civil servants working at global level, for example as trade negotiators, humanitarian coordinators, climate envoys or climate diplomats, or SDG envoys working on post-2015. Working assiduously on aid delivery in poor countries is probably no longer the route to high office in contemporary development agencies. No doubt, alliances are fluid, and non-governmental connections more lively, but collective action theory teaches us that effective institutions to manage collective action both reduce the transactions costs and increase the chances of success. Indeed, when I developed an eight step programme for improved global governance, in 2005, I drew on a review of collective action theory to argue that institution-building was key. Institutions are especially important when repeated, iterated interactions have to be managed. The evidence comes from sources as diverse as common property resource management in developing countries, business associations in New York, and the traditional Clubs of international relations. The fourth axiom, however, is that a quick look out of the window suggests that Clubs are proliferating, but to rather little effect: global clubs are not, taken as a whole, in good shape. The UN has agreed the post-2015 global goals, it is true, but faces criticism especially for the failure of the Security Council, for example on Ukraine and Syria. Ban Ki moon himself has expressed frustration. The WTO? Struggling to close the Doha negotiations. The UNFCCC? Heading for what looks like only a small step forward in Paris. The EU? How about the way it has handed the euro crisis or the migrant influx? And, of course, the ACPAfrica, Caribbean and Pacific itself, commissioning multiple reviews to help it find a new role. In this contest, the EUEuropean Union and the ACPAfrica, Caribbean and Pacific together form a kind of Club, the EU-ACP, also with problems. Is this a post-colonial relic? Is the idea of partnership a sham? Has the agenda dissipated, as trade barriers have fallen? Is the membership still relevant, as new regional groupings, like the African union, have come to predominate. Certainly, all these views have been aired. In brief, then, an uninspiring moment, a worrying moment, in the history of multilateralism. But what would be better? The fifth axiom is that Clubs should be judged by whether they are (a) relevant, (b) effective, and (c) efficient – and this provides both a template for analysis and a route to reform. Relevance, effectiveness and efficiency are, of course, standard evaluation terms. That does not mean they cannot usefully be applied to the analysis of Clubs. A key point is that Clubs should be relevant, effective and efficient in relation to other Clubs. First, Clubs should be relevant. That means they should address contemporary problems, not just those of the past. I tried not to talk about the ACPAfrica, Caribbean and Pacific specifically in Brussels, but to my mind EU-ACP trade relations and EUEuropean Union aid to the ACPAfrica, Caribbean and Pacific are both of declining relevance in the longer term. Rising issues include those mentioned earlier, including climate change, global economic governance, disease threats and crime. It is interesting that both the EU and the OECD have published reports in the last few weeks on Policy Coherence for Development. 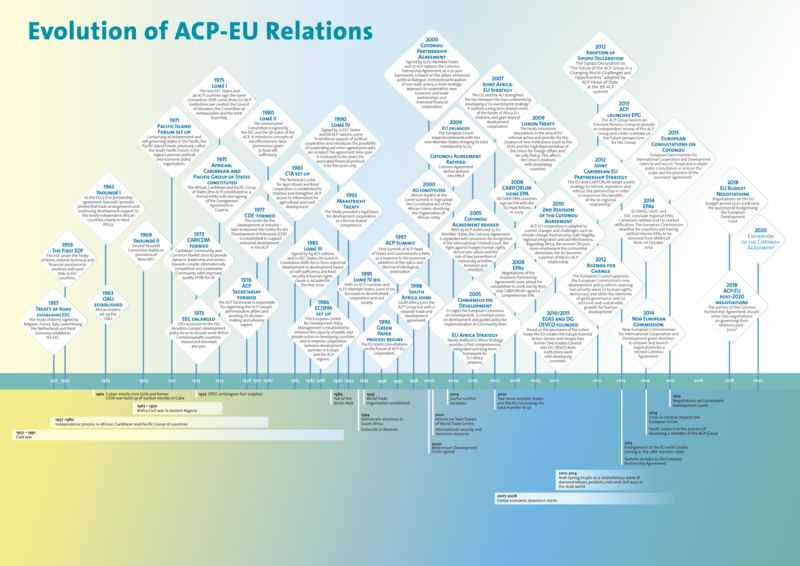 Just as an illustration, the table of contents of the EUEuropean Union report is in Figure 1. It lists many issues that some Club or other should take up. Second, however, Clubs should be effective. Not every Club needs to cover every issue. A golf club does not have to have a swimming pool, a tennis court and a gymn, let alone a room in which to negotiate international treaties. Some of those functions may be more effectively provided by others. In international relations, nation states have multiple options. In the case of the UK, for example, membership is available of the UN Security Council, NATO, the Council of Europe, the Commonwealth, and the EU, as well as the EU-ACP. The UK, like other countries, also has bilateral options. Ministers make choices at the margin as to how their objectives can best be met. Sometimes, one option will be preferable, sometimes another. Institutions, not least the EU, sometimes forget that they have to strive to be the tool of choice. That means they have to: solve market failures that cannot be overcome bilaterally; or overcome coordination failures; or offer economies of scale or scope. As the old advert for British Caledonian Airways had it: ‘we never forget you have a choice’. The managers of international Clubs probably need that engraved in brass and kept on their desks. Finally, Clubs should be efficient. Mostly, that means minimising cost, accelerating decisions, and generally providing value-for-money to all participants. Remember, these thoughts do not relate specifically to the EUEuropean Union Club, the ACPAfrica, Caribbean and Pacific Club or the EU-ACP Club. I do have thoughts about each of those, but perhaps for another day. In general, though, I am an enthusiast for multilateral action and believe that Clubs have an important role to play. I ended in Brussels by turning Groucho Marx on his head. Groucho famously said: ‘Please accept my resignation. I don’t care to belong to any Club that will have me as a member’. I take the opposite view of any Club that can demonstrate it is relevant, effective and efficient: ‘please accept my letter of application’.